We like to say there are “Four K’s” in Karate, but all must have one. 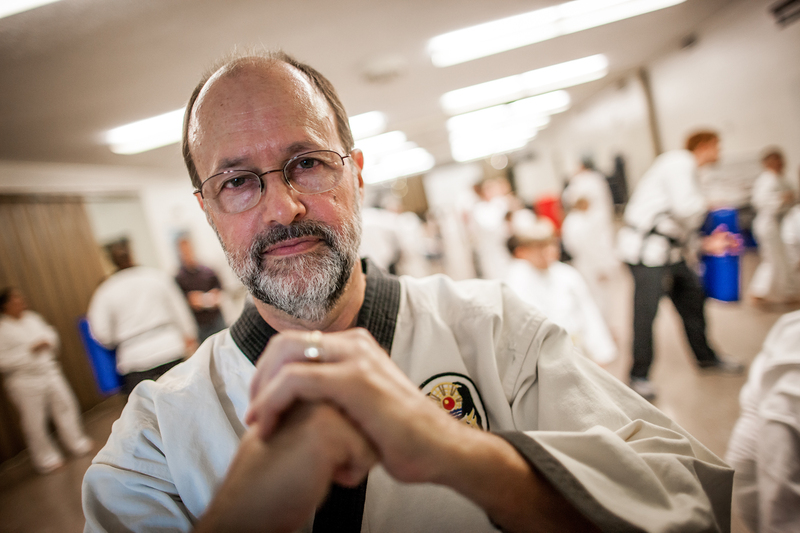 We’ve looked at three of the Four K’s already in this series – Kihon (Fundamentals), Kata (Forms) and Kumite (Fighting) – but there is one more K and we view that in martial arts as most important. It is Kime and translates as “focus.” It’s something that a martial arts judge looks for in the eyes of a competitor. The word Kime means “to decide, fix, set” and expresses the total determination of mind and spirit in accomplishing what the mind has set for the body to complete. That might be breaking a concrete block with their fist, defeating a more powerful opponent, drawing a razor-sharp sword from the saya (scabbard) to cut an apple in half as it is thrown at your face, or performing a physically and mentally challenging Kata in competition. The competitor’s mind is not angry, stressed, upset or anxious. It is tranquil, willing, “focused” on accomplishing the task at hand. Training in Kime leads to increased power and speed because the mind is not encumbered by fear or concern. What matters is completing the task effectively and efficiently. Paul reminded Christians that their greatest goal should be to do God’s will and please Him in everything they do. Becoming a Black Belt in martial arts means focusing on the “right things” which are part of the moral code of martial arts known as Bushido, a code developed by Samurai warriors and passed from generation to generation for centuries. They include Integrity, Respect, Courage, Honor, Compassion, Honesty and Sincerity, and Duty and Loyalty. Bushido is a way of life to a “focused” martial artist. Where do we begin to know what “right things” are for a Christian? We begin “above” in Heaven even as Jesus taught His disciples to pray: “Our Father in heaven, Hallowed be Your name. Your kingdom come. Your will be done On earth as it is in heaven.” (Luke 11:1-2). Our focus as Christians involved in the lives of young people must be on “things above.” We must be able to point the way for students and professors, and that way is above, where Jesus Christ sits at the right hand of the Father. Focusing on “things above” means determining to make disciples and “teaching them to observe all things” that Jesus has commanded. Our personal focus must first be on obeying God’s will and observing all things that Jesus has commanded us, then we can lead others to obey God’s will and the teachings of our Lord. The Greek word for “set your mind” is φρονειτε and means “to direct the mind to, seek for, care for, think, intellect, judge, have understanding, have affection for.” Being a disciple of Jesus Christ is not about following the Christian faith blindly. There is no “blind faith” in Christian apologetics. Defending the Christian worldview begins with our submission to the authority of Jesus Christ and continues to the obeying of His commands and teachings. All Christians should be in agreement that Jesus Christ accomplished the single greatest thing that has ever been done in the history of the world. He died on the Cross for our sins and rose from the dead, “that He might be Lord of both the dead and the living” (Romans 14:9). He is the “propitiation for our sins, and not for ours only but also for the whole world” (1 John 2:2). Paul wrote in Ephesians that God accomplished His eternal purpose in “Christ Jesus our Lord.” It is because of Christ’s complete “focus” on accomplishing His Father’s will that Christians “have boldness and access with confidence through faith in Him” (Ephesians 3:11-12). God also wants to accomplish mighty things in and through us – “For the weapons of our warfare are not carnal but mighty in God for pulling down strongholds, casting down arguments and every high thing that exalts itself against the knowledge of God, bringing every thought into captivity to the obedience of Christ” (2 Corinthians 10:4-5). What mighty things does God have in mind for you this year? What mighty things does He want to do for your Ratio Christi chapter, for your community, your church, your family? As we focus on God’s will for our lives and ministry, as we focus on those things which are above, where Christ is, sitting at the right hand of God, as we focus on accomplishing mighty things for our mighty God, we will see God do what only He can do and what He wants to do for you and the people He has called you to serve. May we all be Black Belts in Apologetics.